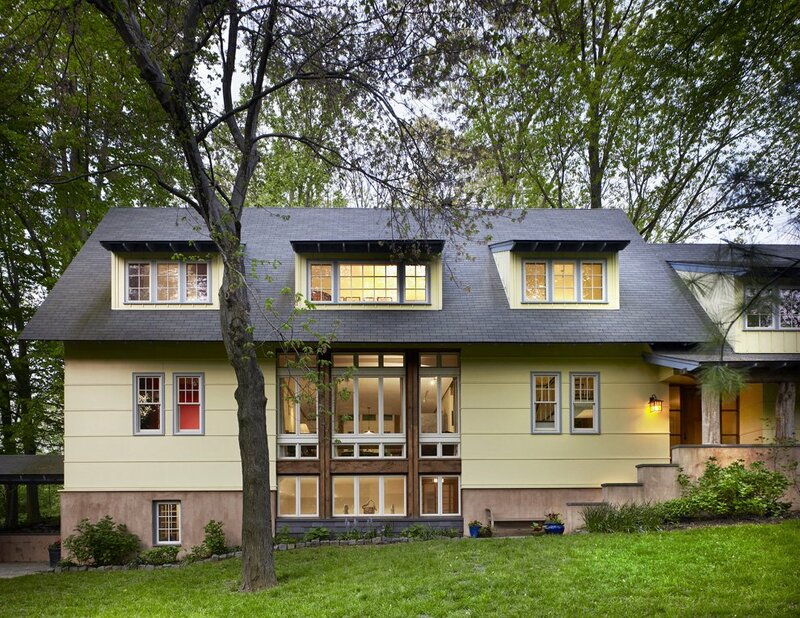 This project represents, at once, one of our most ambitious and most finely focused renovations. Located in an old and heavily wooded suburb of Bethesda, MD we were asked to both significantly enlarge the house (3 bedrooms to 5 plus a new pottery studio & office) while keeping in scale with the neighborhood of small 2 & 3 bedroom homes. Further, we were charged with “save the trees” which gave the site a wonderful sense of place and age. Our solution was to raze the existing house to the existing foundation walls and rebuild, in-place, a 1 ½ storey home. With its big sheltering roof and porches – front and back – the house reflects the owners’ simple values & rustic sensibilities while accommodating this large and active family.